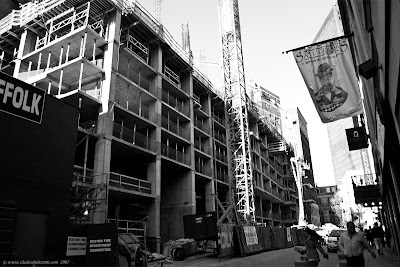 Here is another monthly update of the luxury condo complex being built at 45 Province Street. Another couple of floors in only a month. Click here to see last months update, and here to see my first post. Amazing how fast they go up, huh? I'm sure La Grassa's and Chacarero are laughing all the way to the bank. Great to catch up with your blog again and see what is happening around the traps!!! Great photos!!! I like seeing buildings progress--thanks for the link you included!